If chicken parmesan and pepperoni pizza had a love child, it would be this dish. It is a pretty standard chicken parmesan, but then it's topped with pepperoni before baking. I used to really really hate pepperoni, but now I enjoy it in limited capacities. Like on pizza. Or now on chicken parmesan. This was fairly quick, and very easy. Chicken breasts are coated in panko bread crumbs, then pan-fried. They are then transferred to a baking dish, topping with tomato sauce, cheese, and pepperoni, and baked. Easy peasy. Healthy, this is not. But it was a great meal for a cold and rainy day. And if you already love chicken parm, then this is a really fun and delicious twist on an old classic. Preheat the oven to 450 degrees. In a small saucepan, combine the ingredients for the tomato sauce. Simmer over medium-low heat as you prepare the chicken. In a pie plate, beat the eggs with the milk. In 2 more pie plates (or shallow dishes), spread the flour and panko. Season the panko with salt and pepper. Pat the chicken dry and season with salt and pepper. Lightly dredge each chicken breast in the flour, followed by the egg, and finishing with the panko. Press to help the crumbs adhere. In a large skillet, heat the oil over medium-high heat until shimmering. Add the chicken and cook, turning once, until cooked through, about 7 minutes. Drain the chicken on a paper towel-lined plate, then transfer to a lightly greased baking dish. Top the chicken with the tomato sauce, cheeses, and pepperoni. Bake the chicken for about 15 minutes, until the cheese is melted and bubbling. Transfer the chicken to plates and serve. I love the idea of roni! I am not a pepperoni fan, but my husband and daughter both love it. I will try this one night, making mine pepperoni free. Thanks for the great idea! 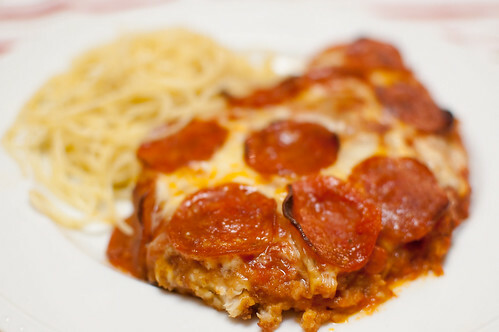 I LOVE the idea of putting pepperoni on chicken Parmesan! How fantastic! I wish there was a button here like on facebook so I could "like" this. It's so cute and I love the idea of combining the two! I have to make this for my husband, he would be tickled by it. Great twist and lovely dish. My daughter loves pepperoni...well she calls them PUPPeroni..she would enjoy this.